Transportation planning and project development involve issues that can affect an area's quality of life, economic development, land use, and environment. In some cases, conflicts can arise among project stakeholders. State and local transportation officials, therefore, need tools to help address multiple perspectives and solve challenges throughout the transportation decisionmaking process. To respond to this need, the Federal Highway Administration's (FHWA) Office of Project Development and Environmental Review commissioned the National Policy Consensus Center (NPCC) to conduct a project to increase awareness of collaborative practices in transportation planning and development. Another objective was to develop an assessment tool for identifying and designing transportation collaborations. A June 2006 report on the project, Transportation Collaboration in the States, is available online at www.policyconsensus.org/publications/reports/docs/TransportationCollaboration.pdf. The NPCC project team designed the assessment tool to collect information in four areas: issues and obstacles in transportation planning and project development; current communication and coordination methods; collaborative approaches; and future opportunities for collaboration and training. The project team tested the assessment tool while interviewing more than 60 State leaders and other stakeholders during site visits to four States. Based on the results of the test, the team refined the tool for use in future assessments and included the updated version in the project report. The cover of the report Transportation Collaboration in the States is shown. The report summarizes key findings from the interviews. The project team found, for example, that States need a comprehensive approach to integrating transportation and land use. Consensus-building and collaborative processes are tools that States can use to achieve this approach. The team also found that metropolitan planning organizations and local governments need to improve collaboration with State and Federal transportation agencies to prevent conflict in such areas as design standards and community preferences. In addition, the team learned that coordination with environmental agencies can be improved by involving the agencies early in the transportation planning process. In the report, the project team outlined a number of recommendations for next steps, which include working with the four States visited during the project to select specific collaborative opportunities for detailed research and assessment. The authors also propose developing guidance for States on best management practices for integrating land use and transportation planning. Such guidance should include information on collaborative systems and computer models that can help integrate land use, transportation, and economic considerations. Highway engineers involved in the design, construction, and quality control of pavements need up-to-date technical information on paving materials, such as the aggregates used in granular base course layers. Engineers also can benefit from understanding the basic chemistry involved in highway construction, such as the chemical composition of asphalt and other materials. To fill that need, the Federal Highway Administration's (FHWA) Office of Infrastructure Research and Development produced two instructional DVDs: "Aggregates for Pavements" and "Chemistry Fundamentals for Pavement Engineers." The DVDs are based on a 3-day workshop that FHWA, the Texas Transportation Institute, and private industry held at FHWA's Turner-Fairbank Highway Research Center during summer 2005. FHWA videotaped the workshops and then digitally integrated the presentations to produce the DVDs. On the aggregates DVD, Richard Meininger of FHWA and Eyad Masad and Dallas Little of Texas A&M University introduce aggregate basics and discuss applications, such as crushed rock and other materials used as a base course, which often is the first layer of material laid down in pavement construction. The speakers discuss the properties of aggregates, such as shape, texture, and abrasion resistance, and the basics on how aggregates are used in base courses and other paving materials. The presenters also review and analyze the use of aggregate bases in the new Guide for Mechanistic-Empirical Design of New and Rehabilitated Pavement Structures developed by the National Cooperative Highway Research Program to provide a uniform, state-of-the-art basis for pavement design. The chemistry DVD provides engineers with a basic understanding of chemistry as it pertains to highway construction. Workshop presenter Terry Arnold of FHWA begins with an overview of fundamental principles, including atomic structure, chemical bonding, ionization, pH, and chemical reactions, such as precipitation, neutralization, and polymerization. He also covers chemistry in everyday life, such as the composition of soap and vegetable oil, and in highway construction, as in the composition of admixtures for concrete and asphalt emulsions. As traffic congestion grows in the United States, many transportation agencies are increasing roadway capacity by expanding highways. In some cases, however, widening roadway embankments or constructing new alignments may require construction over soft or loose soils that are incapable of supporting the weight of traditional fill materials. Reducing construction time to limit the impact on the traveling public also is a challenge. These projects require innovative materials and construction techniques that reduce stress on the underlying soil and accelerate construction. One solution supported by the Federal Highway Administration (FHWA) is the use of expanded polystyrene (EPS) geofoam, a lightweight, rigid foam plastic, as a fill material in construction projects. Because of its strength and lightness, EPS geofoam has the potential to save money and reduce construction times. In July 2006, FHWA's Resource Center, with support from the Agency's Local Technical Assistance Program and the Virginia Department of Transportation (VDOT), sponsored a 1-day demonstration showcase on EPS geofoam. The event, held at the Woodrow Wilson Bridge construction project in Alexandria, VA, drew approximately 50 representatives from State and Federal agencies and private industry. At the showcase, speakers from the Resource Center, VDOT, and the private sector provided an overview of EPS geofoam, which is approximately 100 times lighter than most soils and at least 20 to 30 times lighter than other lightweight fill alternatives. Lightweight fill, such as EPS geofoam, can be used in highway construction to reduce the total load placed on the foundation soils and minimize the potential for settlement or failure. As a result, areas characterized by soft or loose soils that otherwise would be unable to support the combined weight of construction and traditional fill materials now can be used for building new roadways and alignments because EPS geofoam places almost no additional load on the subsurface soils. EPS geofoam also can be used to build highways faster without the need for staged construction. Because EPS geofoam weighs only 16 to 32 kilograms per cubic meter (1 to 2 pounds per cubic foot), large earthmoving equipment is not required for construction. After the material is delivered to the site, construction workers can trim the blocks to size and place them by hand. Workers then can cover the geofoam embankments to look like normal sloped embankments or finish them to look like walls. EPS geofoam is particularly useful in areas with limited right-of-way, and where construction is not easily affected by adverse weather conditions. After the presentations, event participants watched workers install geofoam on the Woodrow Wilson Bridge project at the intersection of U.S. Route 1 and Interstate 95. VDOT selected EPS geofoam for the embankments because of schedule demands and the presence of soft foundation soils. The material cost of EPS geofoam was higher than that of soil fills, but the ease of installation and shorter construction time has reduced overall project costs. The showcase concluded with a discussion on how organizations can expand the use of geofoam to other projects. FHWA's goal is for State highway agencies to routinely evaluate EPS geofoam as a lightweight fill alternative on projects where reducing the stress on underlying soils and shortening the construction schedule are important. For more information on EPS geofoam, visit www.fhwa.dot.gov/crt/lifecycle/geofoam.cfm. According to the Federal Highway Administration's (FHWA) National Bridge Inventory, approximately 156,000 bridges in the United States today are structurally deficient or functionally obsolete. This number is likely to increase in coming years due, in large part, to increased traffic demand, continued bridge aging and deterioration, and limited funds for rehabilitation and maintenance. 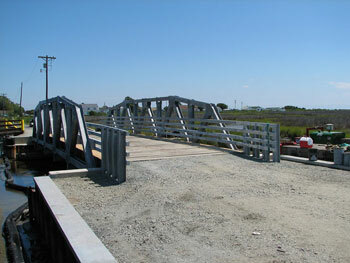 Congressional lawmakers acknowledged this prospect in 1998 when they wrote the Transportation Equity Act for the 21st Century, which established FHWA's Innovative Bridge Research and Construction (IBRC) program to help State departments of transportation (DOTs) and local and county road agencies defray the cost of incorporating innovative materials and technologies in bridge repair, rehabilitation, replacement, and new construction. In 2006, for the third time since 2003, the Commonwealth of Virginia received more than $1 million in IBRC funding to help with bridge projects. The Virginia Department of Transportation (VDOT)-through its research division, the Virginia Transportation Research Council (VTRC)-will use the funding to rehabilitate or replace deficient bridges in three locations. On Tangier Island, in the Chesapeake Bay, two timber bridges over Canton Creek have deteriorated and are difficult to maintain. VDOT has begun work on the replacements, which will have galvanized steel trusses with innovative fiber-reinforced polymer decks that have undergone extensive laboratory testing at Virginia Polytechnic Institute and State University (Virginia Tech). On one bridge, VDOT will install deck panels comprised of pultruded square tubes and plates. The other bridge will include a deck made of pultruded bottom and top plates connected together in the field using stainless steel screws. VDOT also will use precast high-performance concrete with stainless reinforcing steel for the bridge abutments. Through the IBRC program, FHWA provided $400,000 to help defray the costs of the project. Tangier Island has no equipment or personnel for highway maintenance and is located in an extremely aggressive climate, so using durable and corrosion resistant components will minimize future maintenance needs, thereby reducing the long-term costs of transporting crews, equipment, and materials from the mainland. FHWA also provided VDOT with $400,000 to help replace the Route 16 bridge over Fox Creek in Grayson County. The new structure will have precast, full-width, full-depth deck panels made of prestressed concrete, which lends itself to rapid construction and thereby reduces traffic disruptions. Precast components also tend to be more durable, as construction tolerances can be more closely controlled in a plant than in field construction. Virginia Tech will work closely with VTRC and VDOT to develop the deck details and specifications for the bridge, monitor the deck construction to document lessons learned, and conduct live load tests. Finally, VDOT will replace the Route 28 bridge over Broad Run in Prince William County using high-performance concrete in the deck and substructure and self-consolidating concrete (SCC) in the drilled shafts supporting the structure. Using SCC will enhance the workability of the concrete, make the shafts easier to construct, and minimize or eliminate the consolidation problems experienced on other drilled shaft projects. Materials experts from VTRC will work with other VDOT staff to develop the best concrete mixtures for this project, which received $350,000 from FHWA. VDOT has successfully used funds from the IBRC program since the program's inception to move forward with new technologies and enhancements to improve the long-term durability of Virginia's bridges. VDOT has documented its successes and lessons learned on IBRC projects in a series of reports, which are available online at http://vtrc.virginiadot.org under "Projects." In addition to helping agencies pay for bridge projects, the IBRC program aims to reduce congestion associated with bridge construction and maintenance projects, lower the life cycle costs of bridges, enhance safety, and keep the public and the Nation's commerce moving. Bridges on all public roads are eligible for IBRC funding. Transportation agencies can request funds for preliminary engineering and construction work, although construction is given priority consideration. Agencies also can tap IBRC to fund the Federal share of the cost of construction for the innovative materials portion of a project. An important component of the program is documentation and monitoring of the material, and these costs also are eligible under IBRC. Transportation professionals who want to learn more about the Federal Highway Administration's (FHWA) national research and technology (R&T) initiatives or who have questions about R&T programs now have a convenient way to obtain that information. FHWA's Office of Corporate Research and Technology is sponsoring a series of Web conferences on R&T programs. Participants can access the Web conferences online in their offices or meeting rooms. The purpose of the Web conferences is to provide a venue for the latest information on national R&T initiatives and to identify ways that FHWA field offices can participate in those programs or take action at the local level to enhance the delivery of programs. The conferences are targeted at staff in FHWA field offices, but representatives of State and local highway agencies and other transportation professionals are welcome to participate. FHWA launched the R&T Web conference series in September 2006 with a session titled "Engaging the University Transportation Centers (UTC) in Highway Research and Technology: Delivering a Nationally Coordinated R&T Program." The session focused on the U.S. Department of Transportation-funded UTCs, which were created to promote innovative education, research, and technology transfer at universities throughout the country. FHWA has a strong interest in advancing the research at UTCs and moving it into practice. FHWA field office staff is encouraged to assist UTCs in their respective States to develop and deliver their programs, including participating in the project selection process and disseminating and applying research results. These FHWA staff members sitting around a computer in a meeting room are participating in a Web conference on the UTC program. 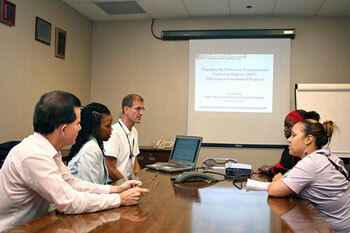 The next R&T Web conference, "Communication Services and the Exhibit Program," is scheduled for October 18, 2006. Future program topics include "Transportation Pooled Fund Program," "Technology Transfer: Roles and Responsibilities," "Statewide Planning and Research Guidance," "Advanced Research," and "Market-Ready Technologies and Innovations." The conferences are available through FHWA's Web-based conferencing system, which is managed by the National Highway Institute (NHI). After registering for a conference, participants can access the visual portion of the conference online with a computer and the audio via a telephone line. For a conference calendar and registration information, visit the NHI Web site at www.nhi.fhwa.dot.gov/resources/webconference/. Interruptions in freight movement can have negative economic consequences, both for businesses and consumers. The larger the interruption, the more costly it may be. This is because small interruptions may only involve the freight carrier, but larger interruptions may involve all supply chain partners and the end customers. In particular, longer interruptions caused by situations more serious than everyday traffic incidents can become large enough that the required reaction goes beyond response and cleanup to include recovery and longer term rerouting of freight within the transportation network. To address these longer interruptions, the U.S. Coast Guard (USCG) organized and led the National Maritime Recovery Symposium in Baltimore, MD, in August 2006. The goal of the symposium was to explore ways to keep freight moving following an incident, such as a natural disaster or terrorist action, through a partnering of government and industry. Representatives from the Federal Highway Administration (FHWA) and the Maritime Administration were invited to participate in the symposium along with Jeffrey Shane, the U.S. Department of Transportation's (USDOT) Under Secretary of Transportation for Policy, who was a keynote speaker. Approximately 150 industry and government leaders participated in the 2-day event. During the symposium, USCG staff outlined several scenarios involving large incidents and divided participants into four breakout groups. The groups' task was to find ways to ensure the recovery of freight operations following the incidents. 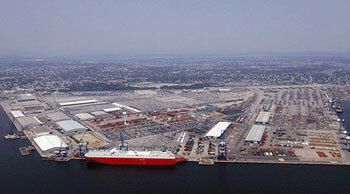 For example, one scenario involved the explosion of a small nuclear device in the Port of Long Beach, CA. Although the blast was small, radiation shut down everything within 0.8 kilometer (0.5 mile) of the port. As a result, both the Port of Los Angeles and the Port of Long Beach were effectively taken out of the port system. Together, Long Beach and Los Angeles have the capacity to handle approximately 30 percent of the containers moving through U.S. ports. If the ports were to shut down, questions would arise over where the alternative capacity would come from to keep freight moving. The breakout groups sought to identify alternative supply chain paths that could be used if this occurred. Recognizing the complex logistical challenges, the breakout groups agreed that it would be critical to have a multidisciplinary decisionmaking team in place to coordinate the equipment and labor necessary to reroute freight flows. Although this scenario focused on a port, the breakout groups concurred that the effects of such an event would be felt throughout the transportation network. Since the marine transportation system depends on the highway and rail networks, group members determined that the recovery effort must include those who operate transportation facilities throughout the United States as well as those involved in freight logistics. Heavy emphasis for support would be placed on FHWA and other operating administrations within USDOT. Both USCG and U.S. Customs and Border Protection have adopted policies to keep freight moving after an incident. The message that staff from the agencies communicated at the symposium was that government and industry need to work together to keep freight moving. Symposium participants noted that it is up to industry, not government, to reroute their cargo. The government's role should be to understand the logistics of the freight industry, provide the industry with information on capacity constraints on alternate routes, and support implementation by, for example, managing the transportation network to accommodate the increased volume at the alternate supply chain nodes. The participants concluded that government and industry need to further develop plans that are adequate and detailed enough to keep commerce moving after an incident. Protecting bridges from heavy trucks and protecting overpasses from tall trucks present challenges for many States. According to the National Bridge Inventory, structural engineers believe that a standard 18-wheel truck does as much damage to bridges as hundreds of passenger cars, and the heavier the load, the greater the damage. Illustrating the height issue, in August 2006 a truck hit overhead bridge supports in Whatcom County, WA, causing extensive damage, resulting in the temporary closure of the bridge and 6 weeks of repairs at a cost of approximately $250,000. The Maine Department of Transportation (MaineDOT) recently tackled both issues, with support from the Federal Highway Administration (FHWA). In summer 2003, cables on the Waldo-Hancock Bridge, which carries U.S. Route 1, were found to be severely corroded. MaineDOT immediately lowered the allowable gross vehicle weight on the bridge from 45,359 kilograms (100,000 pounds) to 10,886 kilograms (24,000 pounds), pending repairs or replacement. Engineers soon decided a new bridge was needed, and a cable-stayed structure is scheduled to open in November 2006. To minimize delays and detours on the existing bridge during construction of the new structure, an innovative strengthening project was completed in October 2003, allowing the weight limit to be raised, first to 36,287 kilograms (80,000 pounds) and then 45,359 kilograms (100,000 pounds) in December 2005. Keeping the bridge operating is critical because the shortest detour is 66 kilometers (41 miles) long and expensive in time lost and fuel consumed. Before the upgrade could occur, MaineDOT had to modify the existing weigh in motion (WIM) equipment near the Waldo-Hancock Bridge so that overweight trucks intending to cross the bridge could be monitored. Previously, the WIM unit could detect only that an overweight vehicle was passing by, but it could not discern which vehicle was overweight. The upgraded WIM units now weigh the vehicles and then use a 900-megahertz (mhz), spread-spectrum radio to send the data to two message boards (also new additions) that display the weight of any trucks that pass over the weight sensors. To enforce the weight restrictions, cameras photograph any vehicle that violates the 45,359-kilogram (100,000-pound) limit. Using license plate numbers, MaineDOT tracks down the owners of offending trucks and reaches agreements on future compliance. So far, cooperation has been outstanding, and MaineDOT has not had to levy any fines. The accuracy of the WIM units was a major concern for MaineDOT, given that ASTM International standards for WIM systems allow for only a 15-percent deviation in accuracy. To improve the accuracy of the units, MaineDOT calibrated them from the 45,359-kilogram (100,000-pound) point rather than from 0. This is critical because inaccuracies are more likely to occur the further the actual weight is from the calibration point. 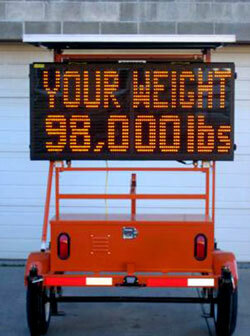 In addition, MaineDOT installed a quartz sensor array to weigh the vehicles. Unlike conventional WIM instrumentation, quartz sensors are impervious to temperature changes, which is important because daily temperatures can fluctuate greatly in Maine, depending on the season. In addition, the use of quartz sensors eliminates the need for frequent recalibrations to maintain a high level of accuracy and the incumbent disruptions to the flow of traffic along a busy corridor. The result is that the WIM units are within 2 percent of exact accuracy. MaineDOT has tracked the results of its WIM system, and its effect has been dramatic. Before the system came online, more than 30 overweight trucks crossed the bridge each day. Since then, however, there has never been a day with even 10 trespassing trucks, and the average day is in the low single digits. In addition to weight problems, MaineDOT recently started addressing the "overheight" issue, and in particular, has focused on I–395 in Bangor. Trucks were striking an overpass on that road an average of once per month. These hits were extremely costly to the State, with many drivers fleeing the scene before the police arrived. To solve the problem, MaineDOT adapted the technology it used at the Waldo-Hancock Bridge, and now a new monitoring system watches for overheight vehicles, activates warning signs, and takes video and photographs of the culprits. The monitoring system consists of three sets of overheight vehicle detectors, three dynamic message signs that are used to warn drivers, a video system used to record offending vehicles, and a flash and camera used to capture license plate numbers. Communication between the signs and a central computer is accomplished with 900-mhz, spread-spectrum radios. To resolve any concerns about accuracy, MaineDOT calibrated the system to 4.33 meters (14.21 feet), allowing for only a small margin of error with the 4.38-meter (14.33-foot) bridge. In the latest innovation, the system sends an e-mail to MaineDOT alerting staff to the passage of overheight vehicles under the overpass. The system on I–395 became fully functional on July 27, 2006. By late August it had already recorded one overheight vehicle and its license plate number. Fortunately, the overheight load was actually a tarp, and it cleared the bridge by less than 5.1 centimeters (2 inches). Although this was a false alarm, it proved that the system worked. MaineDOT officials believe the system will pay for itself. Every time an overpass beam is struck and needs replacement, the cost of repairs is approximately $150,000. In both the overheight and overweight projects, FHWA provided coaching, mentoring, and technical assistance to MaineDOT. Looking forward, MaineDOT may replicate the overweight and overheight innovations at other sites. According to officials, the WIM setup was a "special case" but could be repeated should the need arise. The overheight array already is expected to be used again at other overpasses.